Want to experience the best of Florida? 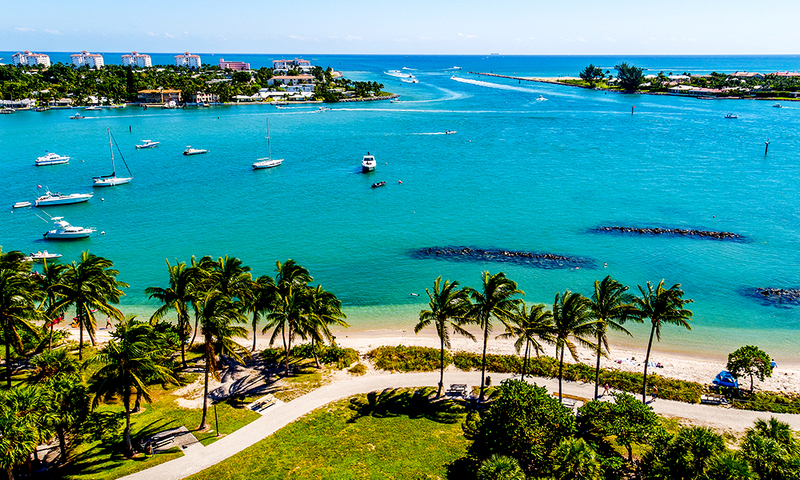 Look no further than The Palm Beaches: America’s first resort destination, where 47 miles of glittering Atlantic coast await. This tropical playground and aquatic paradise is just an hour from Miami by car, and two and a half hours from Orlando. Expect a welcome as warm as the weather: The Palm Beaches have had more than a century to perfect their hosting skills, thanks to oil magnate Henry Flagler. This ambitious New Yorker was the first to spot the region’s incredible potential as a holiday destination in the late 19th century; he quickly established the Florida East Coast Railway system and built two smash-hit hotels. Learn more about The Palm Beaches’ history by paying a trip to the Flagler Museum. Since Henry’s heyday, The Palm Beaches have lured a crowd as sparkly as the ocean: from the Kennedys to the Pulitzers. That’s not to say it’s snooty, mind – this is one of the friendliest places you’ll ever encounter, equally suited to families, couples (whether straight or gay), A-listers and their entourage. Boca Raton Boca, to the locals – is the second largest and southernmost city in The Palm Beaches. It’s home to five miles of beautiful beaches, peaceful parks and scenic golf courses, plus jazz clubs, museums, galleries and top-notch shops. The city’s distinctive architecture was the vision of Palm Beach architect Addison Mizner; many of his iconic buildings still stand today, along with Mizner Park, which often hosts free concerts. There’s more to Delray Beach than its eponymous stretch of sand: nicknamed ‘The Village By the Sea’, this boho beach town is popular for its creativity, culture and cool. Start at arterial Atlantic Avenue, where tempting restaurants, cafés, bars and boutiques await. Sun-worship at the municipal beach, sip local brews at the Saltwater Brewery or get zen at the Morikami Museum and Japanese Gardens. West Palm Beach will instantly boost your Instagram feed, thanks to its waterfront views, palm-lined streets and historic ’hoods. Explore downtown’s Clematis Street, where you can shop til you drop, eat til you pop (not quite), or cut shapes on a dancefloor. Stay in downtown for CityPlace, a lively retail and entertainment district. Sporty types won’t want to miss a baseball session at the Ballpark or at the Roger Stadium in nearby Jupiter. For families, there’s the South Florida Science Center and neighbouring Palm Beach Zoo & Conservation Society.